There is no denying that the Animation Studio is a popular place to be in the Children’s Creativity Museum. It only takes a few minutes for claymation’s endless possibilities to draw in visitors of all ages. What would it be like to be a professional animator? CCM interns heard about claymation from an expert last month. Dave Osmand from Shademaker Productions, a stop-motion animation company in San Francisco, visited the museum and spoke to educators and interns. Osmand brought along some of the tools of his trade: wooden implements for shaping clay and creating detailed expressions in his characters. He demonstrated their use and then let CCM staff practice molding their own clay characters. Meanwhile, Osmand captivated everyone with stories and sage advice about animating. He outlined the main principals of animation (of which there are a large but variable number, depending on who you talk to). Osmand has been animating all his life. He loved cartoons as a kid and gravitated towards Daffy Duck. He always enjoyed playing with clay and that remains his favorite medium for stop-motion animation. As a professional, Osmand became a stop-motion lip-sync expert and worked on films like Wallace and Grommit and Chicken Run. The highlight of the visit was the opportunity to see an animator in action. 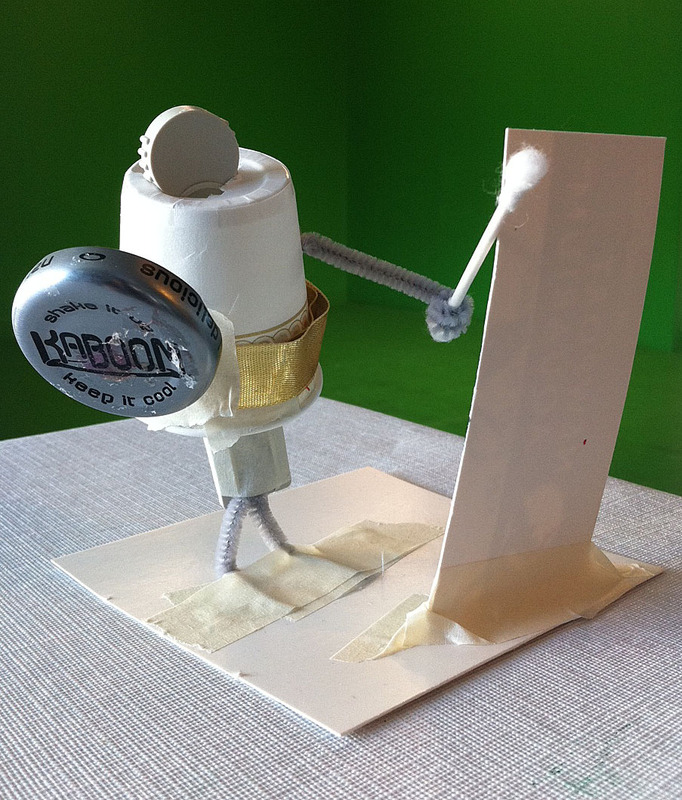 Osmand graced the CCM stages with his stop-motion skills in a wire figure walking demonstration. His audience challenged him to make the wire figure (or armature) sneak across the stage. Osmand’s personality came through in his movements and he was a captivating storyteller. While Osmand painstakingly adjusted and readjusted his armature, he explained some of his techniques. Practicing movements he was animating with his figure was an important part of the process. Osmand tried a sneaky walk over and over again himself so he could get it just right in the animation. The result was impressive! Dave Osmand left CCM staff in awe of the time and effort that goes into professional stop-motion animation. He also contributed some exciting new ideas for our animation studio that we can’t wait to try! “Come on in! There are craft supplies in the birthday party room. Make yourself a name tag telling the story of how you got here.” Thus began my first day of training as an intern at the Children’s Creativity Museum. I picked out a rectangular piece of blue foam and fired up my long-dormant coloring, cutting, and gluing skills. Needless to say, it had been a while since anyone had asked me to tell a story with pictures. I’m a word girl most of the time. My new internship already had me thinking and working outside my comfy academic routine. The Children’s Creativity Museum (CCM) drew me in with the promise of experience working with kids in a museum setting and learning about education through principals of design and creativity. I say museum, because CCM calls itself a museum, not because it looks or feels anything like any museum I have ever experienced. Coming from an academic, object-centered museum background, an environment devoid of glass cases filled with shiny old things took some getting used to. What were we supposed to teach kids about if there were no exhibits, no history, no content? Okay, so maybe I already knew it wasn’t fair to say the CCM had no content. I knew the value of creative expression and play going into this internship, at least I thought I did. Over the course of my training with fellow interns and our first few days on the job, I learned that I had been grossly underestimating the substance of this object-less museum. My first days at CCM are already a blur of mini art projects, clay, music videos, and playing with computer programs. Sounds like fun, huh? Of course it was fun but I was also learning valuable lessons that would be indispensable to me as an education intern. That is, I was learning about the design process and how it could draw creative thoughts out of my brain that I didn’t even know were in there. We interns are expected to facilitate the three C’s of 12st century skills: Creativity, Collaboration, and Communication, which is the Children’s Creativity Museum’s mission. Training to work as an education intern involved moving though the interactive exhibits ourselves, an experience that got us playing with the same tools and activities our young visitors would use. Initially, I was self conscious about my lack of drawing skills, shy about singing and dancing on camera, and worried that I would not be able to guide kids through the same activities. However, it only took a few hours of time with my fellow interns before the sense of camaraderie and lessons we were learning loosened us up. 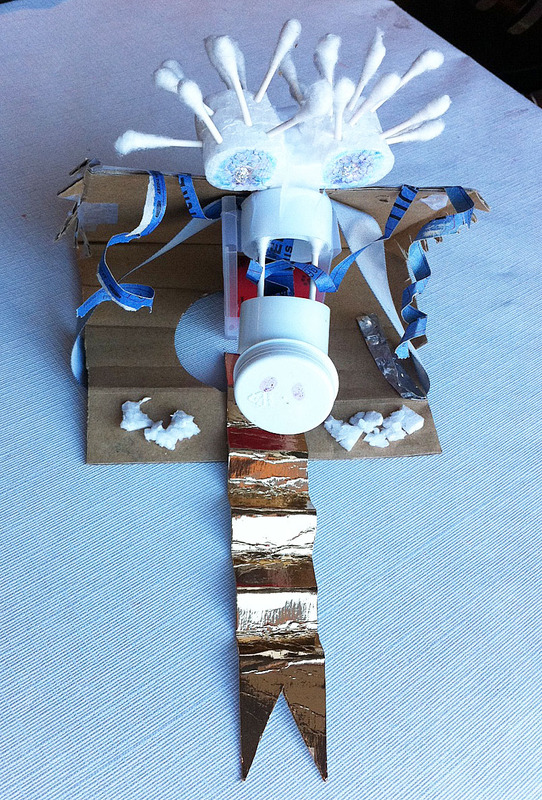 We learned to Imagine, Create, and Share, which involved exploring crazy ideas, building prototypes that sometimes failed, and expanding upon the ideas of others within our group. I haven’t felt so liberated since before I cared if the kid next to me in class was better at coloring inside the lines! Above all, I think the most important thing I learned over the course of training was only obvious once I started working with kids in the museum. That is, that innovation is a process and it doesn’t happen in a vacuum. Superficially, I knew these things already. I studied anthropology in college and graduate school so I am familiar with how cultures influence each other and constantly change over time. In practice, however, I tend to focus on finished products and try to come up with unrealistically original ideas because I want to be totally unique. There is nothing like watching a family shape clay characters for hours on end to drive home the concept of innovation as a process. There was not only innovation going on at their table, but learning, playing, and collaboration. As to the lack of a vacuum, all I had to do was hang out in the Music Studio for a few minutes on the CCM’s grand re-opening day to have that lesson hammered home. I heard kids sing the same song as the two kids before them and I saw others perform off-the-wall, highly choreographed music and dance routines. The extent to which children influence each other as well as draw inspiration from popular culture should not be surprising but sometimes it manifests in incredible ways. Personally, the most meaningful thing I learned during education intern training was that the Children’s Creativity Museum hopes to teach kids and families to use their creative juices and design skills to send messages, accomplish goals, and generally make an impact on society through innovation, collaboration, and communication. That is a principal that I am proud to support and excited to share. At Zeum, we are constantly trying to re imagine the way kids learn and create, whether that means introducing kids to new technologies, developing project based educational frameworks, or simply developing activities that inspire imagination and play. In our attempt to get kids more engaged in what they’re learning or creating, we know that one thing is for sure: any change starts with an idea, and more often than not it’s best to start big. This week our Education Team of college interns went to Stanford University’s School of Education to visit the Learning Fabrication Lab, directed by Professor Paulo Blikstein. Inspired by the Constructionist learning theories of Seymore Papert, Professor Blikstein is exploring how learning changes when kids are given tangible tools to model and build their ideas. With his team of researchers and students, Paulo develops new technologies for rapid prototyping, digital fabrication, and learning design. One of the Lab’s main goals is taking the high-cost and highly developed technologies they’ve developed (which include 3D scanners and printers, and laser cutting) and scaling them down for the classroom. Taking big ideas and making them kid-friendly, the Lab promotes change in how kids learn in school, in particular by making the standard educational approach more engaging and hands on. 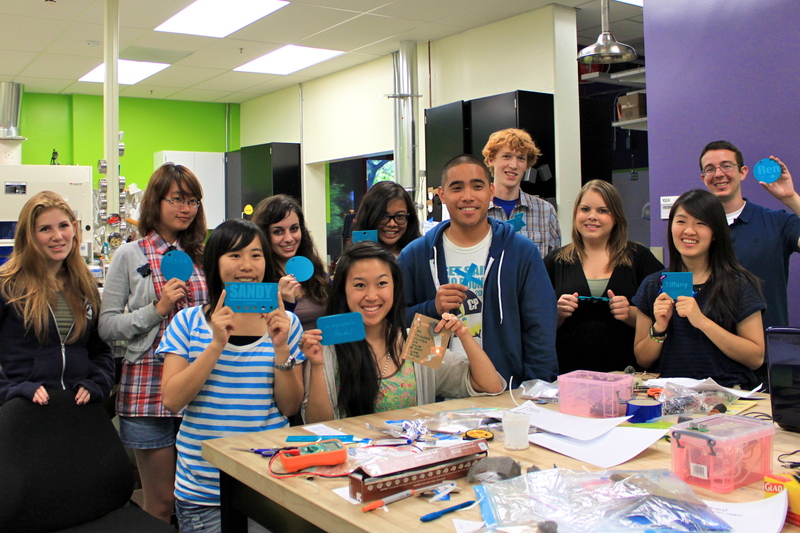 Rather than having students learn from a teacher’s lecture, the FabLab encourages kids to learn science and technology by making and designing—a kind of learn as you go method. 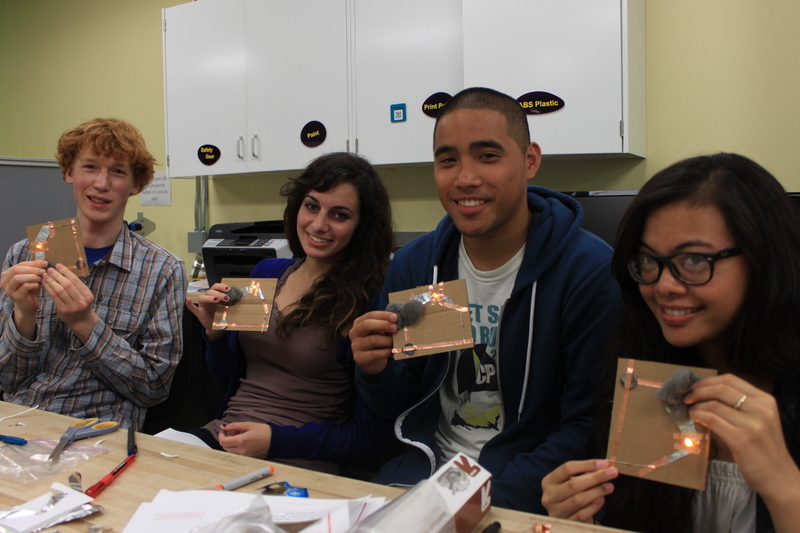 The FabLab showed the Zeum Team their GoGo Board, a robotics kit and software, and a lightning bolt circuitry postcard (similar to our Squishy Circuits creative workshop). Both the kit and the postcard are low-cost, and could easily be implemented in schools or interactive museums like Zeum. At the end of our visit, we brainstormed ways to take inspiration from the FabLab’s advanced technology, and bring that same learn as you go method into Zeum. Our Mystery Box, Squishy Circuits, and 3D Space creative studios are just the start—What would you do with a 3D scanner or a laser cutter machine, both worth thousands of dollars? What would a kid do with them? Better yet, how might we scale them down to make them both useful and available to everyone?